This article is about the ancient portion of Anatolia. For Galatai, see Gaul. For other uses, see Galatia (disambiguation). 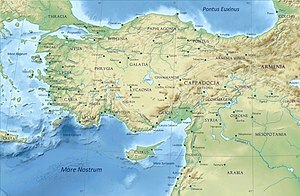 Ancient Galatia (/ɡəˈleɪʃə/; Ancient Greek: Γαλατία, Galatía, "Gaul") was an area in the highlands of central Anatolia, roughly corresponding to the provinces of Ankara, Çorum, and Yozgat, in modern Turkey. Galatia was named for the Gauls from Thrace (cf. Tylis), who settled here and became its ruling caste in the 3rd century BC, following the Gallic invasion of the Balkans in 279 BC. It has been called the "Gallia" of the East, Roman writers calling its inhabitants Galli (Gauls or Celts). Asia Minor/Anatolia in the Greco-Roman period. The classical regions and their main settlements, including Galatia. Galatia was bounded on the north by Bithynia and Paphlagonia, on the east by Pontus and Cappadocia, on the south by Cilicia and Lycaonia, and on the west by Phrygia. Its capital was Ancyra (i.e. Ankara, today the capital of modern Turkey). The terms "Galatians" came to be used by the Greeks for the three Celtic peoples of Anatolia: the Tectosages, the Trocmii, and the Tolistobogii. By the 1st century BC the Celts had become so Hellenized that some Greek writers called them Hellenogalatai (Ἑλληνογαλάται). The Romans called them Gallograeci. Though the Celts had, to a large extent, integrated into Hellenistic Asia Minor, they preserved their linguistic and ethnic identity. By the 4th century BC the Celts had penetrated into the Balkans, coming into contact with the Thracians and Greeks. In 380 BC they fought in the southern regions of Dalmatia (present day Croatia), and rumors circulated around the ancient world that Alexander the Great's father, Philip II of Macedonia had been assassinated by a dagger of Celtic origins. Arrian writes that "Celts established on the Ionic coast" were among those who came to meet Alexander the Great during a campaign against the Getae in 335 BC. Several ancient accounts mention that the Celts formed an alliance with Dionysius I of Syracuse who sent them to fight alongside the Macedonians against the Thebans. In 279 BC two Celtic factions united under the leadership of Brennus and began to push southwards from southern Bulgaria towards the Greek states. According to Livy, a sizable force split off from this main group and head toward Asia Minor. For several years a federation of Hellespontine cities, including Byzantion and Chalkedon prevented the Celts from entering Asia Minor but this changed when Nikomedes I of Bithynia allied with some of the Celtic leaders in a war against his brother Zipoetes and the Seleucid king Antiochus I. When the Celts finally entered Asia Minor chaos ensued until the Celts were briefly routed by Antiochus' army in the Battle of Elephants. In the aftermath of the battle the Celts withdrew to Phrygia, eventually settling in Galatia. The territory of Celtic Galatia included the cities of Ancyra (present day Ankara), Pessinus, Tavium, and Gordion. Upon the death of Deiotarus, the Kingdom of Galatia was given to Amyntas, an auxiliary commander in the Roman army of Brutus and Cassius who gained the favor of Mark Antony. After his death in 25 BC, Galatia was incorporated by Augustus into the Roman Empire, becoming a Roman province. Near his capital Ancyra (modern Ankara), Pylamenes, the king's heir, rebuilt a temple of the Phrygian god Men to venerate Augustus (the Monumentum Ancyranum), as a sign of fidelity. It was on the walls of this temple in Galatia that the major source for the Res Gestae of Augustus were preserved for modernity. Few of the provinces proved more enthusiastically loyal to Rome. Josephus related the Biblical figure Gomer to Galatia (or perhaps to Gaul in general): "For Gomer founded those whom the Greeks now call Galatians, [Galls], but were then called Gomerites." Others have related Gomer to Cimmerians. Paul the Apostle visited Galatia in his missionary journeys, and wrote to the Christians there in the Epistle to the Galatians. Although originally possessing a strong cultural identity, by the 2nd century AD, the Galatians had become assimilated (Hellenization) into the Hellenistic civilization of Anatolia. The Galatians were still speaking the Galatian language in the time of St. Jerome (347–420 AD), who wrote that the Galatians of Ancyra and the Treveri of Trier (in what is now the Rhineland) spoke the same language (Comentarii in Epistolam ad Galatos, 2.3, composed c. 387). In an administrative reorganisation (c. 386–395), two new provinces succeeded it, Galatia Prima and Galatia Secunda or Salutaris, which included part of Phrygia. The fate of the Galatian people is a subject of some uncertainty, but they seem ultimately to have been absorbed into the Greek-speaking populations of Anatolia. A Galatian's head as depicted on a gold Thracian objet d'art, 3rd century BC. Istanbul Archaeological Museum. Galatian bronze horse bit, 3rd century BC, Hidirsihlar tumulus, Bolu. Istanbul Archaeological Museum. Galatian bracelets and earrings, 3rd century BC, Hidirsihlar tumulus, Bolu. Istanbul Archaeological Museum. Galatian torcs, 3rd century BC, Hidirsihlar tumulus, Bolu. Istanbul Archaeological Museum. Galatian plate, 3rd century BC, Hidirsihlar tumulus, Bolu. Istanbul Archaeological Museum. Galatian object, 3rd century BC, Hidirsihlar tumulus, Bolu. Istanbul Archaeological Museum. Part of a 15th-century map showing Galatia. ^ a b Strobel, Karl (2013). "Central Anatolia". The Oxford Encyclopedia of the Bible and Archaeology. Oxford University Press. ISBN 978-0-19-984653-5. Retrieved 2018-05-15. ^ See Diod.5.32-3; Just.26.2. Cf. Liv.38.17; Strabo 13.4.2. ^ a b c Enenkel, K. A. E.; Pfeijffer, Ilja Leonard (January 2005). The Manipulative Mode: Political Propaganda in Antiquity : a Collection of Case Studies. Brill. ISBN 978-90-04-14291-6. ^ Moscati, Sabatino; Grassi, Palazzo (1999). "4: Ancient Literary Sources". The Celts. Random House Incorporated. ISBN 978-0-8478-2193-8. ^ See also Strabo, vii, 3, 8. ^ Cunliffe, Barry (2018-04-10). The Ancient Celts. Oxford University Press. p. 81. ISBN 978-0-19-875293-6. ^ Strobel, Karl (2013). "Central Anatolia". The Oxford Encyclopedia of the Bible and Archaeology. Oxford University Press. ISBN 978-0-19-984653-5. Retrieved 2018-05-15. ^ Krentz, Edgar (1985-01-01). Galatians. Augsburg Publishing House. p. 16. ISBN 978-0-8066-2166-1. ^ Josephus. Antiquities of the Jews, I:6. Wikimedia Commons has media related to Galatia. This article incorporates text from a publication now in the public domain: Chisholm, Hugh, ed. (1911). "Galatia" . Encyclopædia Britannica. 11 (11th ed.). Cambridge University Press. pp. 393–394. Encyclopedia, MS Encarta 2001, under article "Galatia". Barraclough, Geoffrey, ed. HarperCollins Atlas of World History. 2nd ed. Oxford: HarperCollins, 1989. 76–77. John King, Celt Kingdoms, pg. 74–75. The Catholic Encyclopedia, VI: Epistle to the Galatians. David Rankin, (1987) 1996. Celts and the Classical World (London: Routledge): Chapter 9 "The Galatians". Coşkun, A., "Das Ende der "romfreundlichen Herrschaft" in Galatien und das Beispiel einer "sanften Provinzialisierung" in Zentralanatolien," in Coşkun, A. (hg), Freundschaft und Gefolgschaft in den auswärtigen Beziehungen der Römer (2. Jahrhundert v. Chr. – 1. Jahrhundert n. Chr. ), (Frankfurt M. u. a., 2008) (Inklusion, Exklusion, 9), 133–164. Justin K. Hardin: Galatians and the Imperial Cult. A Critical Analysis of the First-Century Social Context of Paul's Letter. Mohr Siebeck, Tübingen, Germany 2008, ISBN 978-3-16-149563-2.